Manchester United are reportedly confident they can strike a compromise to keep goalkeeper David de Gea at the club. This is despite the Daily Mirror reporting that there’s been some setback in that pursuit, with the Spain international refusing to budge on some hefty wage demands. According to the Mirror’s report, De Gea wants around £350,000 a week to remain at Old Trafford, which would make him the second highest earner behind only Alexis Sanchez. While De Gea is undoubtedly one one of the very finest ‘keepers in world football, that is a huge amount to be forking out each week for someone in his position. This worrying update follows a recent report from the Metro which suggested an agreement was close for the 28-year-old to commit his future to the Red Devils. Still, United have the money and should surely just pay whatever it takes to ensure they don’t lose such an important player. 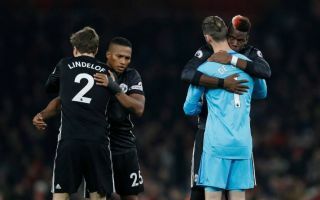 Replacing De Gea would likely cost them a ton in the transfer market, so it might be better financially to just cough up for a big new contract for their current shot-stopper.